WHAT'S WRONG WITH A LITTLE BAD? Imagine a man who finds out he has terminal cancer, and he will die soon. Add this bad news to the fact that he has a wife and a disabled son he is already supporting, on a flimsy at best teacher’s salary, and a soon-to-be-delivered baby - a third mouth he will be responsible for. What would you do if placed in a similar situation? This question is one reason so many support the wildly popular show Breaking Bad. Watchers continually flock to this series because it puts them in the position of deciding what they would be capable of doing - for the benefit of their family. And from what I can tell, by listening to people discuss the show, or reading through newspaper articles and blogs, there ain’t a whole hell of a lot that person wouldn’t do for their families. 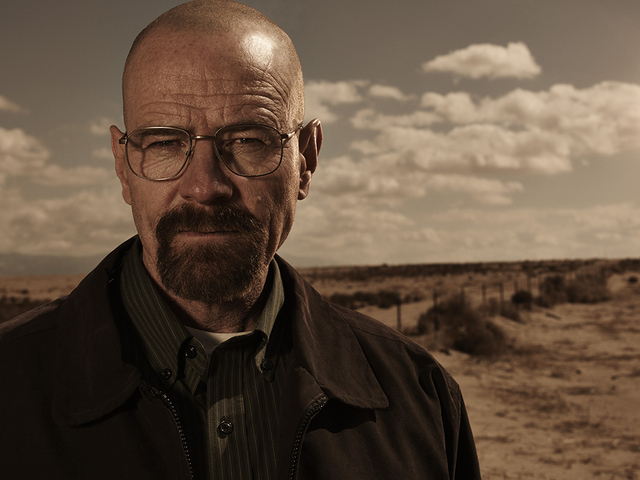 Running with this idea, creator Vince Gilligan purposefully placed the watcher of his hit show in an awkward position. We see this character, Walter White, and what he is doing, and we justify the atrocities he commits as necessary for the survival of his family. We ourselves becomes complicit in the crimes he commits not only against the people who stand against him (Gustavo Fring, Tuco, the skinheads) but we also justify the horrendous crimes he commits against his own family members. When we watch these actions on screen, and judge whether we would be capable of doing the same thing, we act as accessories, and more often than not, we enjoy these visions of normal-guy-turned-sociopath. This isn’t a new revelation. All we must do in order to see this idea take shape is watch small children cheer as Ursula is stabbed and killed in The Little Mermaid. As stated above, we develop an understanding of the binary of good vs. evil, and, for most of us, we rally behind the good characters, while wishing for the bad characters to come to the brutal end they all deserve. The problem with this binary, as is the problem with most binaries, is that it allows for a very simplistic, black and white view of the world, which we all know as adults, isn’t how the world works. Thus with the increasing frustrations of life, dichotomies like good vs. evil break down and the popularity of the antihero increases. This fact isn’t to say that the binary is flipped. Flipping a binary would mean that rather than Superman being the hero, and occupying all the moral high ground accompanied with that position, Lex Luthor would be applauded for his sociopathic tendencies. Literally, a flip of characterizations based on archetypes would rotate the negative and the positive. For an antihero to work, the character must inhabit both positive and negative spheres. Antiheroes don’t simply live in one of these predestinated spaces, demonstrating our difficulty when trying to pin them down into one of these two boxes. They can’t be confined into this space. Instead, they occupy the middle, gray area between the white and the black. Realistically, antiheroes violate traditional black and white thinking. In their article, Shafer and Raney scientifically trace out why we enjoy the antihero narrative. For both authors, they define an antihero as “[displaying] qualities of both heroes and villains…acting in morally ambiguous, and at times unjustifiable ways, even if to reach noble goals.” After running tests on groups of people, the authors of the study suggest that the results are split into distinct categories. On the one hand, if people had seen the movie, TV show, or played the game that was being presented to them, then they were more likely to justify an antihero’s decisions, even if those decisions result in violence. If the audience members had never seen the TV show, movie, or played the game, then they castigated the antihero for his/her decision. For the authors, this reaction demonstrated the audience's willingness to become attached to characters in a show, movie, or game after a period of time. Another way of putting this point is to say that if you watch a TV series, for instance Mad Men, then you see the character Don Draper as a part of your life. Once a week, you allow this character to come into your home and entertain you. Essentially, what the authors found was that we are more likely to justify atrocities committed by a character that we have formed an attachment with through continued viewing of the show that the antihero is a part of. On the other hand, the study also showed that people who had never seen the character before didn’t look favorably upon the actions as the antihero, even if those reasons were steeped in revenge. All of this is to say that much like family members, and close friends, we are able to justify even negative actions because we assume that the person is doing them for the right reasons (revenge, for instance), or because we know deep down the person is a good person and might have been pushed to do something he or she wouldn’t normally do. Another reason that we pardon the antihero might be found in our desire to live vicariously through them. Stephen King explores this fascination in his nonfiction piece “Why We Crave Horror Movies.” King’s main argument is that we watch horror movies because they invite us “to lapse into simplicity, irrationality and even outright madness.” Later in his article, King argues that since infanthood we have all been socially trained to act in a certain manner. When someone is rude to us, we are trained to try and resolve the issue peacefully - not to punch that person in the face instead. Obviously, there are some people who do whatever they want, regardless of how socially unacceptable their course of action might seem to outside eyes and judgments. These people are typically placed in roles of crazy, trashy, or outsider. King posits that we go to horror movies because they “deliberately appeal to all that is worst in us. It is morbidity unchained, our most basic instincts let free, our nastiest fantasies realized.” The antihero, like the horror movie, grants us a kind of catharsis, a kind of release. All of these reasons also work for why we justify the actions of the antihero. We look at characters like Don Draper, Walter White, Al Swearingen, and Stringer Bell and we wish we could do as they do. That is, when someone is rude to me, I wish that I could act like Stringer from The Wire and take them out. Have the power associated with fear. We all participate in this thing we call life, and most of us do it properly. Much like horror movies, the antihero speaks to something inside of us - this something inside of us is the little crazy voice who would rather act as a vigilante for people who aren’t able to defend themselves. For one high school teacher in Texas, the antihero trope is definitely apparent in one of her favorite shows: Orange Is the New Black. Piper, the female protagonist (I argue the antiheroine of the show), is sentenced to prison for trafficking drugs. Once in prison, Piper turns from naïve inmate to one who is caught up in the game of survival. Even though Piper’s niceties are quickly drowned, this teacher still generally likes her character: “For the most part, she treats the other characters with respect and does stuff to help her fellow inmates out. Because of this, I like Piper even though she is very self-motivated and willing to play with people’s emotions.” Even though Piper is narcissistic, the teacher still values her character. Perhaps she wishes she could be a little more like Piper and have adventures beyond the high school classroom. Perhaps she wishes she could have a more assertive personality and life. Maybe even be a little bit more like Walter White. For all of these reasons - including cultural frustration - antiheroes are a part of our culture in a big way. Not only do we feel for them because of their duplicitous nature, but we also live out hidden fantasies through them. With the explosion of them in our popular culture, the antihero seems to be infiltrating our national narrative one character at a time. Perhaps we all need a little bad in our lives sometimes.